These days, Apple is more properly thought of as a fashion label, not an electronics company. 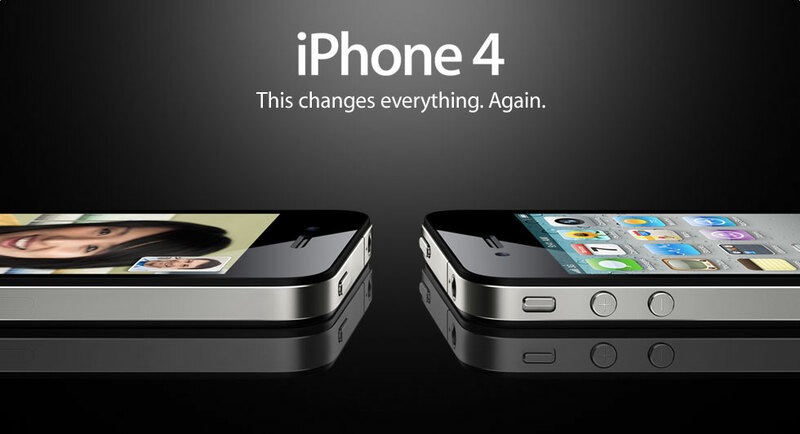 When Apple launched the iPhone 4 in 2010, the company's website featured large images of the device with the text "This changes everything. Again." Change has been a constant refrain in Apple's marketing over the years. 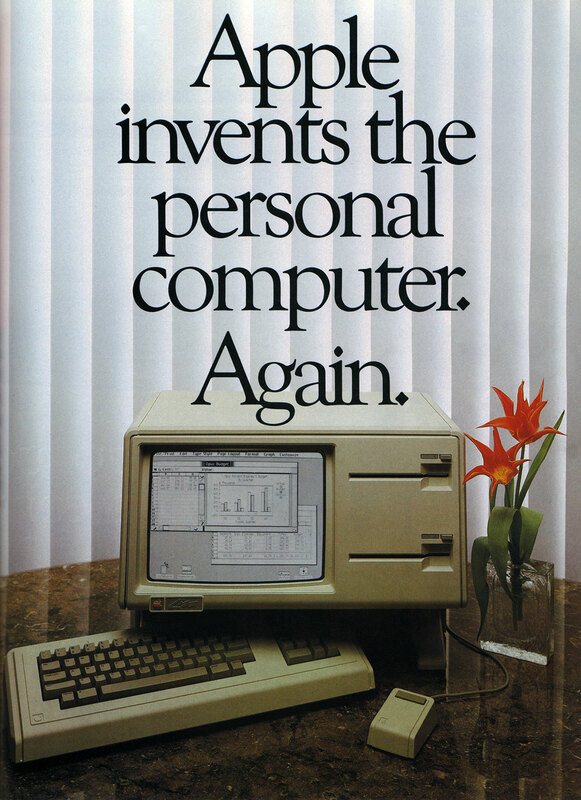 The famous 1984 Macintosh ads framed the computer as an agent of revolution. And the "Think Different" ads of the 1990s implied that purchasing one of these underdog machines put you in the same company as other misunderstood genius underdogs. But it goes back further than that, too. 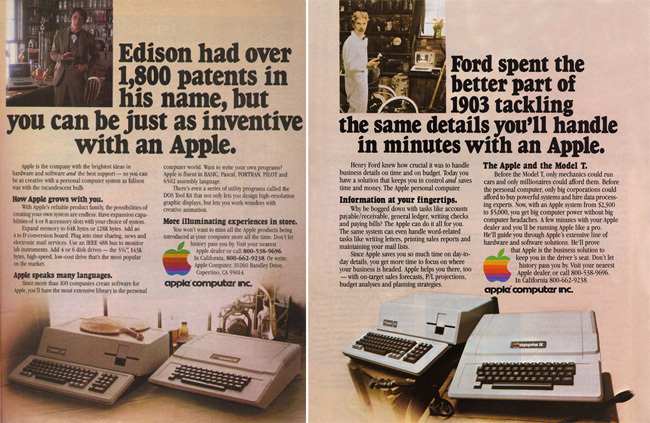 Ads for the Apple II and the business-oriented Apple III in the early 1980s compared their power to that of famous inventors of ages past, including Henry Ford, Thomas Jefferson, and Ben Franklin, among others. If you watch the original 2007 iPhone announcement, you'll be hard-pressed to deny the device's overall revolutionary claims. But the "change" associated with subsequent models has been fairly modest, despite Apple's frequent claims to the contrary. The iPhone 4 or 5S hardly compare to the Apple II, the Macintosh, or even the original iPhone in their implications and impact. They have offered small but important updates: high-resolution displays, more sensors, increased battery capacity, faster processors, better cameras. Fingerprint security in iPhone 5S is an interesting advance, but it's hardly an innovation akin the printing press or the airplane or the personal computer. Indeed, it's not an innovation at all, but merely a refinement and systematic roll-out of an old idea that hadn't yet caught on, but might be ready to do so. Why does Apple try to pass off a predictable (and easily predicted), gradual evolution of their existing platform as change of the more revolutionary kind? Hyperbole is one possible answer. "Change" has become an idea so synonymous with Apple that it must be perpetuated through its branding and marketing even when real change may be lacking. Another might be hubris. In his push to get products done just his way, Steve Jobs had a history of making missteps into evolutionary dead-ends. Just take a look at this print ad for the 1983 Apple Lisa. It uses the same sentence construction as the iPhone 4 spread three years ago, with these same full stop after "Again." But neither of those explanations are complex or subtle enough to characterize Apple's approach to consumer electronics product launches. Change is no longer political nor social nor industrial, as in the case of 1984 or Henry Ford. Instead, it's commercial and aesthetic. For Apple, "change" no longer refers to revolution. It refers to fashion. Apple is becoming more like Prada and less like Edison. This has been the case for some time, it was just harder to notice as the iPhone was undergoing large-scale adoption. But in retrospect, Steve Jobs's keynotes functioned more like catwalks than like product demos. And the Apple Store has always been a boutique as much as an electronics shop. But now that Jobs is gone, we can see this shift from futurism to fashion more clearly. Take this week's iPhone announcements. Instead of promising change and revolution, the iPhone 5C offers itself "For the colorful," a slogan we'd be more likely to see from Benetton or J. Crew than from Apple. The company (maybe we should start calling it a "label") is releasing a new line, seasonally, and needs to train its audience to feel increasingly comfortable dropping hundreds of dollars each season. The "change" in question is not regime change, but a change between tennis at the club and dinner downtown. For its part, The iPhone 5S dispenses with the false promise of revolution in favor of the modest and sensible slogan "Forward thinking." The device's black, silver, and gold colors signal the elegance and simplicity we associate with choosing a finish for a Mercedes or a bezel for a watch. It points even further into Apple's future than does the iPhone 5C's affordable couture seasonality: like an automobile, the top-end iPhone is becoming a necessity, even if a luxury one. Even the wealthy don't buy a new car every year. But when needed or strongly desired, a new model helpfully designates itself, along with a set of modestly novel features and styling choices that will be replaced soon enough. Hip fashion and elegant necessity aren't revolutionary, and it's dishonest to pretend they are. Some have lamented the latest salvo in Apple's product arsenal, blaming Tim Cook for betraying the company's commitment to the "revolutionary" ideals Steve Jobs seemed to embody. Even The Onion weighed in: Apple Unveils Panicked Man With No Ideas. But Apple's transition from computers to clothier began long before Jobs' death -- he just managed to avoid its consequences by establishing himself as legend. The most impactful and lasting revolutions don't fetishize revolution itself, but establish a new regime that lasts over time. That's the legacy of the Apple II (personal computing), the Macintosh (computing for everybody), and the iPhone (computing in your pocket). We can't handle seasonal revolutions, even if it were possible to produce meaningful upheaval that rapidly. Just think of how we relate to Apple's laptop products: We treat them as necessities and ponder when to upgrade based on the urgency of our needs as regulated by the appeal of an incrementally improved model. The personal computer was once a revolutionary device, but now it's just a device. So too the iPhone, hereby transitioned from ingenious novelty to ordinary instrument, in only six year's time. Apple now deals in haute couture, not in high tech.